This cute Pembroke Welsh Corgi pup is on his way to big school for the very first time! He's a bit nervous, but his Mum has made him a tasty packed lunch, so he's all set for the day. 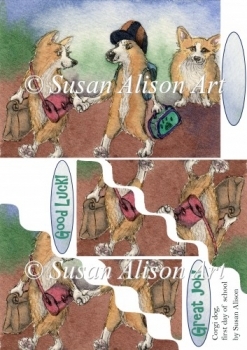 A whimsical wavy edged stacker which builds to a 3D effect 5" x 7" greeting card, perfect for any dog lover, particularly one who likes Welsh Corgi dogs. Greetings include Good Luck!, Great Job! - there is also a blank tag for your own sentiment.